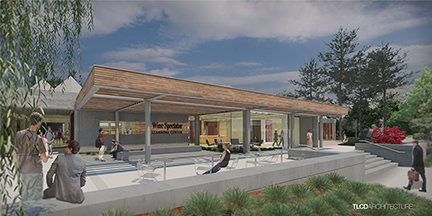 A public groundbreaking ceremony will take place for the Wine Spectator Learning Center at Sonoma State University on Wednesday, June 1 at 10:30 a.m. The former University Commons building is scheduled to become the future home of the School of Business and Economics' Wine Business Institute in summer 2017. The event marks the beginning of a yearlong interior and exterior building transformation project designed to meet advanced learning and education requirements for the beneﬁt of students, the campus community, and California State University system. Speakers include Sonoma State University President Ruben Armiñana, School of Business and Economics Dean William Silver, U.S. Congressman Mike Thompson, Lieutenant Governor and candidate for Governor of California Gavin Newsom, and Wine Spectator Magazine Publisher and Editor Marvin Shanken. A naming gift of $3 million was given by the Wine Spectator Scholarship Foundation toward the $9.15 million project. "This event is groundbreaking in more ways than one," says Silver. "As the global leader in wine business education and research, we're not just breaking ground on the future home of the Wine Business Institute, we're charting the roadmap for an industry." The 15,000-square-foot building will include three state-of-the-art classrooms, multimedia venues for production and broadcast of public seminars and events, international-themed gardens and student success pathway, and collaborative spaces for hands-on learning such as a student commons, faculty-industry hub, and café. "The Wine Business Institute is a unique program which, more and more, is supporting executive development to meet the wine industry's dynamic growth needs," says Shanken. "The Wine Spectator is honored to play a role in supporting the Institute and the California Wine Industry." "Today's wine industry faces substantial pressure from globalization, disruptive technologies, and climate change," says Silver. "More than meeting employment demands, our faculty and students are shaping how this global industry adapts and evolves. Thanks to the outpouring of generosity from our partners, the Wine Business Institute is well positioned to continue driving innovation, informing public policy, and training future generations of leaders for a dynamic industry." In addition to the Wine Spectator Scholarship Foundation, generous contributions from the following people and organizations help support the project: Robin and Michelle Baggett of Alpha Omega Winery and Tolosa Vineyards & Winery; Roy and Rachael Cecchetti of Cecchetti Wine Company; Wayne Chaplin of Southern Wine & Spirits; Gerret and Tatiana Copeland of Bouchaine Vineyards; Alan Dreeben of Republic National Distributing Company; The Gallo Family of E & J Gallo Winery; The Hamel Family of Hamel Family Wines; Gary Heck of Korbel Champagne Cellars; Terry Lindley of American AgCredit; Wally and Ellie Lowry - the first Director of the Wine Business Institute; Charles Merinoff of Charmer-Sunbelt Group; The Michael Family of Peter Michael Winery; Fred Pierce of Pierce Education Properties; Ron Rubin of The Rubin Family of Wines; Alex Ryan of Duckhorn Wine Company; and Chris and Vern Underwood of Young's Market Company.